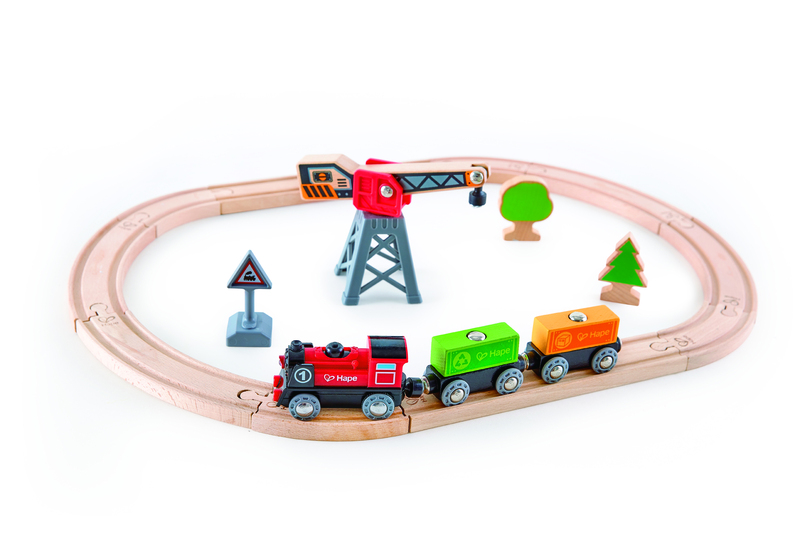 This interactive Cargo Delivery Loop Railway from Hape is bound to impress young train drivers! Use the magnetic crane to load and unload containers from the train, then press the button on the engine and watch the train speed around the track, but don’t forget to stop to make deliveries along the way! Gift Wrap: To add gift wrap please tick the checkbox above. Use the ‘order notes’ box on the checkout page to add any personal message you would like adding to the gift tag. Please note an additional £2.50 will be added to your order. 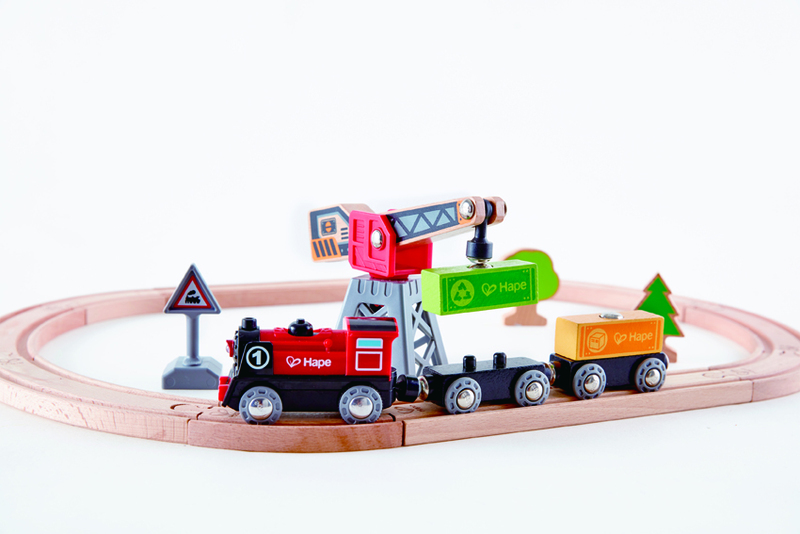 This interactive Cargo Delivery Loop Railway from Hape is bound to impress young train drivers! Use the magnetic crane to load and unload containers from the train, press the button on the engine to watch the train speed around the track, but don’t forget to stop to make deliveries along the way! This oval track is easy for little ones to set up and includes a battery operated train and two cargo carriages which couple together magnetically, 2 trees, a road sign, plus a magnetic crane to unload and unload cargo. Made from natural materials with plastic accessories, this wonderful train set is finished in non-toxic, child safe colours and is compatible with other Hape train sets. Requires 2 x AA batteries (not included). Railways are a traditional favourite with children and help develop good hand-eye coordination and imaginative play. A prefect beginners train set. Hape is one of the world’s largest producers of toys and educational concepts made from sustainable materials including wood, bamboo and bioplastic. Hape keep children at the heart of everything they do. Their innovative, eco-friendly designs and meticulous quality ensure products meet, and often exceed, the strictest of international safety standards. Hape is committed to making better products and respecting the world in which we live. A philosophy that embraces sustainability, education, innovation and fun, to create a range of wonderful toys that represent the next generation of play.